The Goethe-Institut’s network of 97 libraries in 70 countries offers worldwide access to over 800,000 media. Every day the libraries of the Goethe-Institut receive about 1,000 requests for information. In our libraries visitors can experience Germany directly through themed media collections, comprehensive learning and counselling services and competent contact persons. 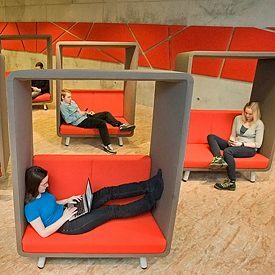 Our libraries are meeting places that enable a free and uncensored access to knowledge and information. 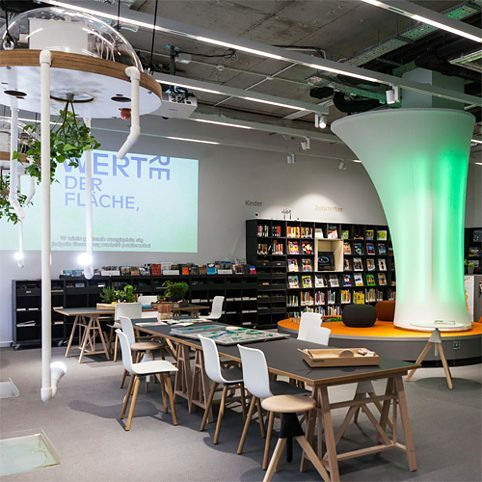 In many places, the libraries of the Goethe-Institut are the only such facility in the host country. 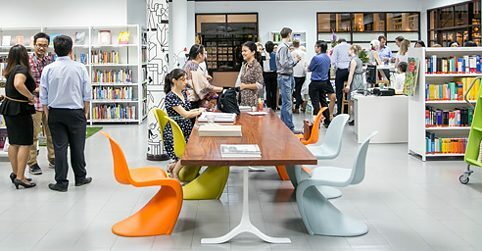 The libraries of the Goethe-Institut see themselves as nodes in a global network; they serve and support German reading rooms, dialogue points and German information and learning centres and cooperate closely with libraries in the host countries. The librarians of Goethe-Institut provide a range of qualified services in research and support. 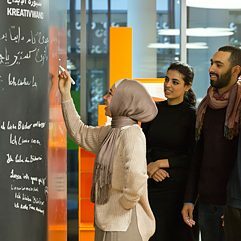 The libraries of the Goethe-Institut maintain close contact with national library associations, universities and experts, and provide information on libraries and the information landscape in Germany. Take a look at some of our library projects and acitivies around the globe in the past few years. A media center for children and young people with limited access to libraries in Iraq, Jordan, Lebanon and Turkey. The mobile library providing books and activities for children from Syria, Lebanon and Palestine in the Beequa Valley, Tripoli and Saida. Reading makes the world go round! A literary flash mob in 13 South American cities. Why own a sewing machine when you can borrow one? A treasure box of useful and joyful things in the library to rent. The VR adaptation of Franz Kafka’s “The Metamorphosis”. A collaboration with the film director Mika Johnson and producer Shahid Gulamali. A retrospective on the remake of the library in Bratislava. Talented new authors in Egypt create short stories at writers' workshops and discuss them with their peers. Reading, Watching, Listening, Gaming! Celebrating 60 years of the library in the Goethe-Institut in Cairo. Hub@goethe in Johannesburg offers creative entrepreneurs eight workplaces, an informal training programme and mentoring. Our "Cherrypicker" blog presents a varied selection of works from the wealth of new German-language publications. Every week a new recommendation, every week an opportunity to discover outstanding texts, images and voices. By now it's generally known that libraries do far more than lend books. They are in fact educational and information centres, places of learning and creativity. 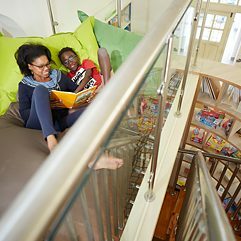 What makes a library a favourite spot? Users tell us in the series "My Library". 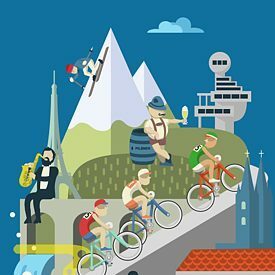 Cube sugar, cooperatives, postcards: these inventions and achievements not only originated in Europe but also through European exchange. We are collecting such European “heirlooms” – an tell their stories. The Goethe-Insititut and the German Library Association (Bibliothek & Information Deutschland (BID)) facilitate jointly the grant programme "German library experts go abroad" ("Deutsche Bibliotheksexpertinnen und –experten ins Ausland"), which aims at fostering the exchange between the German and international professionals. The Goethe-Institut and the BID provide financial support for residence scholarships, conference participation and study trips abroad for German library professionals. In July 2018, the Stuttgart Media University and the Goethe-Institut e. V. organized an international summer school for „young emerging leaders“ from the library sector. The topic of the summer school was "Socially Committed, Innovative, Accessible to all: Libraries of the Future Contribute to the United Nations Agenda 2030" and focused on the role of libraries in supporting the UN Sustainable Development Goals. The Goethe-Institut e.V. and Stuttgart Media University are going to cooperate on a new edition of the summer school, which will take place from 16.-21.9.2019 in Stuttgart.